A recent study led by scientists at the U.S. Department of Energy’s SLAC National Accelerator Laboratory helps describe how the contaminant cycles through the environment at former uranium mining sites and why it can be difficult to remove. Contrary to assumptions that have been used for modeling uranium behavior, researchers found the contaminant binds to organic matter in sediments. The findings provide more accurate information for monitoring and remediation at the sites. The results were published in the Proceedings of the National Academy of Sciences. In 2014, researchers at SLAC’s Stanford Synchrotron Radiation Lightsource (SSRL) began collaborating with the U.S. DOE Office of Legacy Management, which handles contaminated sites associated with the legacy of DOE’s nuclear energy and weapons production activities. Through projects associated with the Uranium Mill Tailings Radiation Control Act, the U.S. DOE remediated 22 sites in Colorado, Wyoming and New Mexico where uranium had been extracted and processed during the 1940s to 1970s. Uranium was removed from the sites as part of the cleanup process, and the former mines and waste piles were capped more than two decades ago. Remaining uranium deep in the subsurface under the capped waste piles was expected to leave these sites due to natural groundwater flow. However, uranium has persisted at elevated levels in nearby groundwater much longer than predicted by scientific modeling. 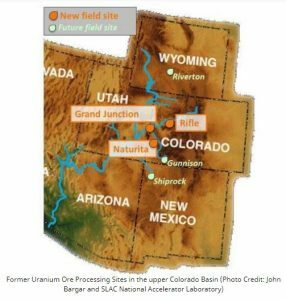 In an earlier study, the SLAC team discovered that uranium accumulates in the low-oxygen sediments near one of the waste sites in the upper Colorado River basin. These deposits contain high levels of organic matter — such as plant debris and bacterial communities. During this latest study, the researchers found the dominant form of uranium in the sediments, known as tetravalent uranium, binds to organic matter and clays in the sediments. This makes it more likely to persist at the sites. The result conflicted with current models used to predict movement and longevity of uranium in sediments, which assumed that it formed an insoluble mineral called uraninite. Different chemical forms of the element vary widely in how mobile they are – how readily they move around – in water, says Sharon Bone, lead author on the paper and a postdoctoral researcher at SSRL, a DOE Office of Science User Facility. Since the uranium is bound to organic matter in sediments, it is immobile under certain conditions. Tetravalent uranium may become mobile when the water table drops and oxygen from the air enters spaces in the sediment that were formerly filled with water, particularly if the uranium is bound to organic matter in sediments rather than being stored in insoluble minerals. This cycling in the aquifer may result in the persistent plumes of uranium contamination found in groundwater, something that wasn’t captured by earlier modeling efforts.